“This match gives the Moncus Park Veterans’ Memorial a lot of momentum – especially considering its timing. The Fourth of July is the perfect holiday to consider how we come together to leave a legacy of honor for our Veterans. We’re already in the patriotic spirit, and the Memorial will be an exceptional place to pay all Veterans tribute and respect,” continues Brooks. The Hamners offered the match to help reach the $1,000,000 fundraising goal in the hopes that the Veterans Memorial will be fully funded and built as part of Phase 1 construction. “Once this match is met and added to the other generous gifts from the community, we will be three-quarters of the way to our Memorial goal,” says Brooks. The Veterans’ Memorial in Moncus Park will be a place of remembrance and respect for veterans and their loved ones. 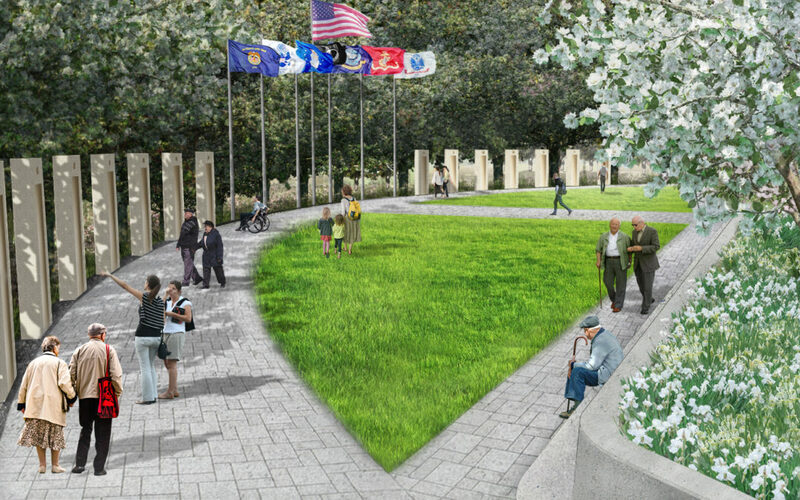 Throughout the planning and design process for the park’s master plan, and specifically for the Memorial, Veterans have been engaged every step of the way. The involvement of veterans of all ages was important to ensure that this beautiful space will serve the needs of many different types of Veteran events, including memorial ceremonies, military weddings, holiday celebrations, and much more. The semi-circular memorial space will feature large stone tablets inscribed with the history of American military conflicts throughout our nation’s history. In addition to serving as an educational experience for all ages, the Memorial will also be a place of quiet and reflective gratitude for the sacrifices of the men and women who have served our nation. It has the endorsement of the Veterans’ Action Coalition, comprised of leaders of several regional Veterans’ organizations in Acadiana, who have also been supporting fundraising efforts toward the Memorial by selling both brick pavers and seat-wall inscriptions to honor or memorialize someone who has served. For more information on how you can support the Veterans Memorial at Moncus Park, visit give.moncuspark.org/veteransmemorial, or contact Moncus Park by calling 337-500-1177 or emailing info@moncuspark.org.